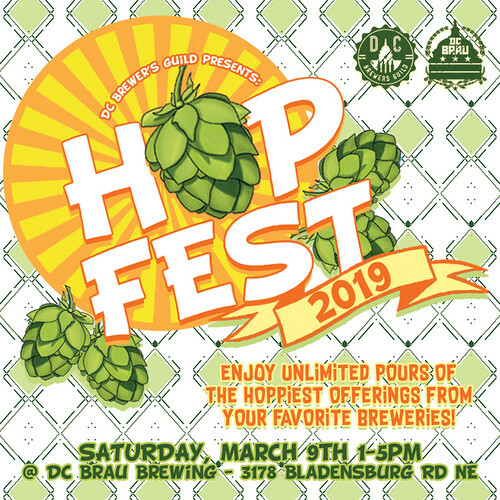 Your first best bet will be HopFest held at DC Brau on March 9th. In its 5th year, this hop-friendly beer jubilee is pitched as ‘by local brewers, for local brewers’, to support the DC Brewers’ Guild. Many local breweries will offer, for your drinking pleasure, rare beers and standards alike. Drink all you like. We assume you can handle that. Why this beer festival? You’re supporting your local breweries (they love you too), and it’s held at an actual brewery (DC Brau)! And there are a ton of local breweries participating. See the list of breweries below. There will also be food trucks, including Timber Pizza, Dangerously Delicious Pie Truck and The Frenchman Food Truck.